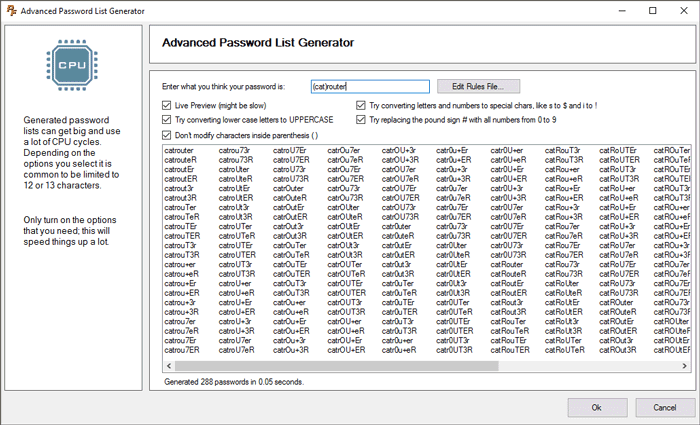 The Find Password App includes a very handy featured called Advanced Password Generator. This is a tool that quickly generates lists of passwords to try when attempting to recover a lost or forgotten router password. It understands most basic character substitutions that are used in passwords, such as replacing an a with an @ sign as well as lower to upper case substitution and trying numbers from 0 to 9. It's also easy to extend the rules to include additional substitutions that you may have used when setting your router's password. When we need to find your router's password and you don't know what it was, there's generally 4 major categories of passwords to try. When you use Find Password to setup a password recovery session you can choose any or all of these methods. Simple passwords such "password", "qwerty", "123456". Our Find Password App has huge lists of common passwords like these that it can automatically try on your router. Simple passwords actually work 90% of the time because so many people use them. Advanced Passwords like "p@ssw0rd" and "qw3r+y". The challenge with this type of password is that no two people use the same substitutions to come up with their passwords. The Advanced Password Generator gets around this problem by trying all combinations. Passwords that end in an incremented number, such as "password1", "password2" and so on. Advanced Password Generator supports these passwords with a pound sign # in your password. Wherever you put a # in your password Advanced Password Generator will try each of the numbers from 0 to 9. This is completely configurable in the options. Completely random passwords such as "4G65jh2F$!". Advanced Password Generator supports this kind of password. In order to recover this sort of password you need a brute force list. You can generate a brute force list by editing the character codes file as described below. If you have exhausted all other password recovery options such as known router passwords and common password lists then it's time to fire up the Advanced Password Generator. This should really be a last option because password lists are so effective at logging in to many routers. The default configuration for the Advanced Password Generator is actually pretty good. If you type in password "cat", you get a list of 48 passwords to try ranging from "cat" to "C47", all the way to "(@7". Most users will want to leave the default settings as they are. However if you are not like most people and your password is particularly challenging, then there are lots of options for you to explore. Each of these options can be disabled by unchecking the box near the top of the screen. The savings here isn't that great because cat is such as short password, but you can see that it will generate 75% less passwords if you disable the upper case option if you know that you do not need it. It will be a lot faster with (cat)router to recover your lost password than with catrouter because there are many less combinations to try. Be careful with # substitution, it can generate massive lists of passwords very rapidly and consume all of your computer's RAM causing system instability. 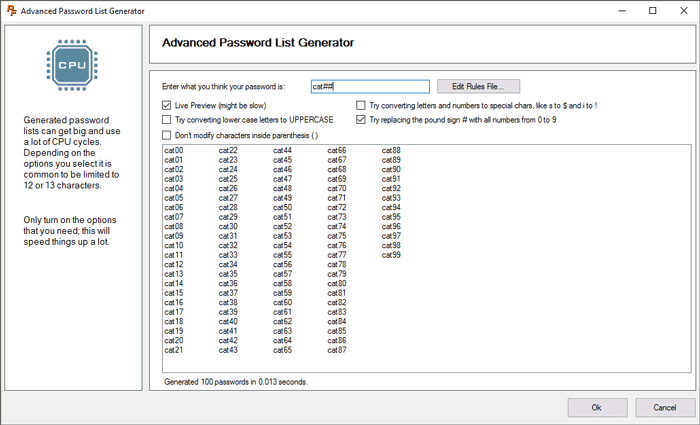 Here's an example of the Advanced Password Generator generating a list of possible router passwords to automatically try based on the password "password". These generated passwords are then used to automatically try to login to your router until one of them works. Warning: This section is advanced. If you don't need this stuff then please skip it. There is one more level of advanced we want to talk about really quickly. If the substitutions being made don't quite work with the way that you generate passwords then you can customize the character substitutions file to suit your exact needs. There is a button to launch the text file and usually Notepad will open it up. The file is called charcodes.txt and it's pretty simple to understand. Lines that start with // are a comment and do not do anything, and likewise blank lines are ignored. All other lines must have a colon in them. a:aA4@ means that an a will be replaced with each of the characters a, A, 4, and @. However, the substitution for capital letters will only happen if you have checked the lower to upper case checkbox. Also, the substitution to 4 and @ will only happen if you have checked the special characters checkbox. In addition the # replacement only happens if you have # replacement turned on, and the ( and ) characters are different depending on if you have the () checkbox turned on. This says "when you see a star, try everything". You can edit this line as appropriate for your password needs. Then in the password box put "********", or as many stars as you need. 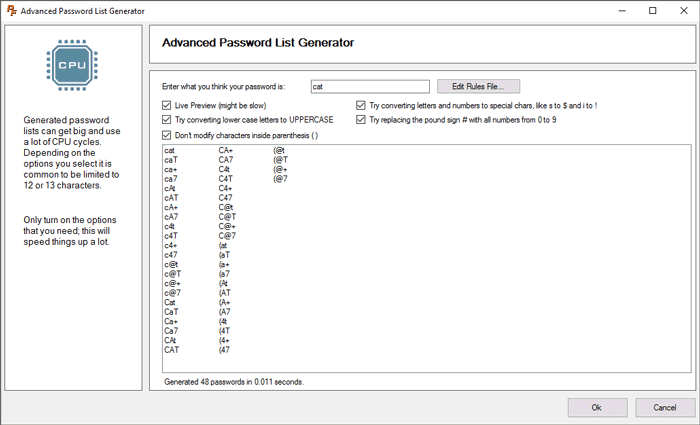 The Advanced Password Generator is a part of Find Password, which is just one of many tools in the Network Utilities suite of applications by Portforward. Some of the tools are free and some of them are not. Find Password is one of the tools that you have to pay for, along with Router Login and PfConfig, an application for setting up port forwards in your router. You can read more about Network Utilities on our sales page or you can Buy It Now. Finding a router's password once it's been lost is a huge task. Here are some more resources that may help. Jason Bauer is an owner and author for SetupRouter.com. He is available on Google+ and you can find more of his articles in the Networking section of our site.